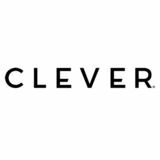 WE GUARANTEE BRAND SAFETY With over a decade of influencer marketing experience, only CLEVER can promise fail-safe programs that always meet legal requirements from the FTC to the ABC. CLEVER activations drive emotional consumer-to-brand connections, drive sales, and provide our clients with stunning content they can use â&#x20AC;&#x201D; and reuse â&#x20AC;&#x201D; forever. Come, toast with us! THE TOAST-ESS WITH THE MOSTEST If you’re not Instagramming it, did it even happen? Not for our influencers. They know how to make parties fun, memorable, and oh-so-’grammable… starting with what they’re serving. As millennials mature, so do their tastes. We love putting our brand partners at the center of these beautiful, celebratory toasts. HOMEGATING: THE TREND THAT’S HERE TO STAY “Game Day” fandom is no longer relegated to beer and chips. Our influencers have endless ideas for delighting sports fans, and really — who doesn’t love partying in sweats? Bring on the Sundays of pulled-pork, seven-layer dips, homemade corn dogs, along with beer… AND wine and cocktails. WHO’S THAT GIRL? Chances are, your target consumer isn’t who it used to be. There’s no single more powerful way to reach, meet, and engage your ideal customer* than featuring her (or him) enjoying your product. *Ask about our full suite of analytics if you need any help identifying your target audience. THE GREAT GRAPE OUTDOORS Camping, glamping, and all manner of outdoor fun calls for cocktails. Whether our influencers are working up a sweat or lounging around, our wine and spirits brands are the summer cooler must-haves. Weâ&#x20AC;&#x2122;re taking the party wherever we go! SEASONAL SURPRISES Our influencers have amazing aesthetics, authentic and creative ideas, and love the holidays. No need to rely on stock photos, our influencers create stunning branded content you can repurpose all year! Let our influencers make the most of your brandâ&#x20AC;&#x2122;s best seasons, popular holidays, and favorite times of the year. HAPPY HOURS & HOURS As the memes all ask us: why limit happy to an hour? Working with influencers gives your brand access to near-limitless content and images at a fraction of the cost of outsourcing to a studio. It’s 5 o’clock somewhere. Sip, sip, hooray! 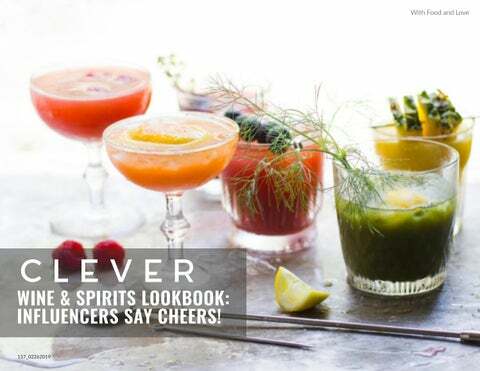 NON-ALCOHOLIC OPTIONS: MOCKTAILS & MORE Our influencers enjoy refreshing beverages of every kind. From waters to juices, elixirs to kombucha, we know how to showcase great tasting, alcohol-free options to audiences of all ages and preferences. REAL PEOPLE TELL THE BEST BRAND STORIES Letâ&#x20AC;&#x2122;s Tell Yours. CLEVER influencers create stunning, one-of-a-kind content for wine & spirits brands.